​Having the ideal weight is essential to support your dog’s health. Although it’s more common to find dogs that need to lose pounds to achieve this healthy weight, there are dogs that actually need to gain them. A pooch could be underweight because of different reasons. For one, he may be recovering from a particular disease or injury. Another reason could be because he’s a picky eater. But with special care and the right kind of nutrition, your dog can gain the pounds he needs to get back to a healthy weight. More specifically, pet owners should focus on giving their underweight pups dog food with high-calorie content. 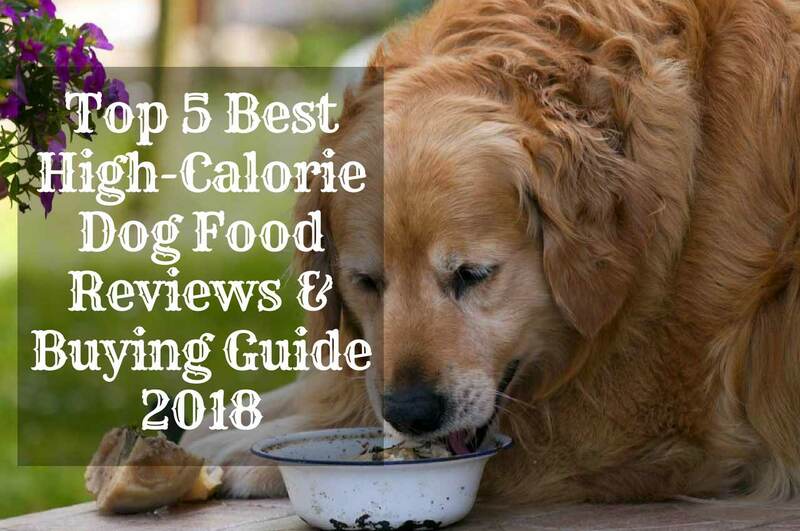 If you’re looking to increase the weight of your pooch, this article recommends some of the best high-caloriepet food. Before we delve into high-calorie dog foods, it’s prudent to first learn the ways of identifying healthy weight for your dog. Ideally, dogs are not built or they don’t grow up in the same way. From the small 4-pound Chihuahua to the gigantic 175-pound mastiff, each breed differs in muscle mass, coat density, and skeletal size. All these factors play a role in the average weight of a dog breed. However, there are general ways of determining whether your dog has a healthy weight. One rule of thumb is that your dog’s abdomen ought to be higher up than his ribcage. This means that from the section of his front legs, his underside should slowly incline upwards towards his rear. A steep incline is an indication that your dog is underweight. Conversely, a very shallow incline suggests that he is overweight. When checking your dog’s profile, try lowering yourself to the point that you are level with him so that you can view him from the side. Another way to determine that your dog is healthy is by assessing his ribs. To do this, place both of your thumbs on his spine and then open your hands over his ribcage. If he is at a healthy weight, then you should be able to feel his ribs under his coat and skin. If there’s too much fat, this indicates that he’s overweight and if you can feel his ribs without the presence of fat, this shows that he’s underweight. Before we can explain this point, it’s important to clarify that malnourishment and poor nutrition are two different things. If your dog is affected by poor nutrition, he will look dull, have a lifeless coat, poor dental hygiene, and experience issues with his poop. Conversely, malnutrition happens when your pooch loses over 10% of his total body weight. The main causes of poor nutrition are excessive eating, lack of enough exercise or eating low-quality dog food. Malnutrition, on the other hand, is the result of the inadequate food supply. In some instances, this is the outcome of abuse although, in other instances, it is simply a lack of knowledge on the part of the dog’s owner. If your furry companion is experiencing some sort of stress or is anxious about something, he may lose weight really fast. Remember that your pet needs to feel safe so that he can eat his food. So, if he is restless because of a new environment or the individuals within his surrounding, he might not feel safe enough to eat. The ASPCA cites some of the signs of anxiety as escapism, continuous barking or howling, chewing, digging, and other destructive behavior. Another reason why your dog may be losing weight is if he is infested with parasites. If your pooch is infested by an intestinal parasite, he is likely to lose weight because the parasite may be consuming all the food he eats. Another possible reason for your dog’s weight loss could stem from a dental problem. If he’s suffering from a dental abscess or some other problem related to his dental hygiene, it may be too painful for him to eat anything. Since he won’t be eating enough, he will end up losing weight rapidly. Before you start purchasing all sorts of high-calorie formulas, there are a couple of things you should keep in mind. Adding just a few pounds of weight represents a significant change for any dog. The last thing you want is to feed your dog a formula that causes him more harm in the long run. To help your pooch gain weight in a healthy way, consider these aspects. If you notice that your dog is underweight, your first instinct might be to increase the amount of food in his bowl. Although increasing the volume of food is the best way to go, adding too much can cause adverse effects in the long-term. Dogs are animals of routine. Some of them also have very sensitive tummies. So, if you overload him with food, he may suffer from stomach problems and fatal bloat. Instead of increasing his food volume blindly, you should make a gradual switch to a food that helps increase his mass. Such dog foods contain unique ingredients that make them nutritionally dense. This way, you won’t have to make a drastic change to his serving size. If your vet recommends increasing his serving size, try splitting it into portions over his daily intake. You can serve several small meals throughout the day rather than feeding him one massive meal. If your pooch has lost a significant amount of weight, chances are that he has not been getting enough protein. Remember that your dog needs protein to develop and maintain muscles. For the best outcome, at least 30% of his food should be made up of protein. But not all protein sources are suitable. The best kinds of protein are ones obtained from a natural meat animal. Steer clear of unhealthy protein by-products that provide sufficient amino acids. The good thing is that high-calorie dog foods are packed with the right amount of protein, fat, omega fatty acids, and other nutrients necessary to keep your pooch healthy. When purchasing these foods, ensure you look at the list of ingredients. If the dog food contains proteins, check the source of these proteins to ensure they are of premium quality. A grand mistake that pet owners make is to make a sudden change to their dog’s diet.Your dog did not lose his weight in a night so you shouldn’t expect him to gain it back overnight. If you decide to substitute his usual meal with food that has more calories, do so in phases. Start by incorporating a small portion of the new food to his initial one. Observe how he responds to this change. If he seems to be responding positively, continue increasing this portion until you replace it completely. With such a slow adjustment, your dog will not experience any stomach issues and you will have less mess to clean. Junk food is just as bad for your pooch as it is for humans. At the core, junk food is merely empty calories that do not add any nutritional value to your pup. Although some fat is essential for your dog’s health, too much of it can lead to health problems. Your objective should be helping your dog increase his muscle mass,not fat cells. So, when purchasing treats, ensure they are of high-quality. More specifically, they should contain more protein and fewer carbohydrates. Besides, you should give him these treats moderately. If you examine this high-calorie formula closely, you’ll see that it’s the best dog food choice to help your pooch become lean and more athletic. Bully Max dog food can be fed to all kinds of dog breeds including puppies as young as five weeks. 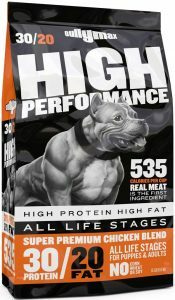 This dog food can be given as the main course meal or as a supplement. Either way, it provides your pooch with a healthy dose of nutrition. Protein, which is derived from chicken meal, makes up at least 30% of this dog food. Fat, which comes from healthy chicken fat, takes up 20%. This means that for every cup of kibble, your dog gets a whopping 535 calories. If your pooch looks emaciated, the Purina Pro Plan formula can help him develop strong muscles. This food contains 30% protein and 20% fat, making it a superb option for fueling your pup’s metabolic needs while also helping him maintain lean muscle. The protein, which comes from real chicken, provides your dog with sufficient amino acids to nourish his muscles. 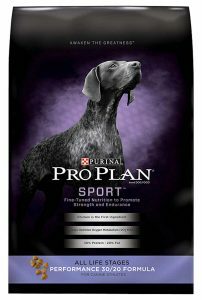 Other than underweight dogs, canine athletes can also benefit immensely from the Purina Pro Plan. Since it constitutes a concentrated nutrition, it helps in optimizing oxygen metabolism to provide increased endurance. Plus, it nourishes your dog’s immune system by defending him against free radicals. 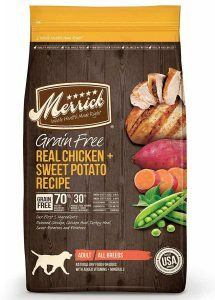 Available in a 25-pound bag, the Merrick Dry Dog Food is another option that can help your dog pack on some pounds. It’s particularly recommended for dogs with sensitivities as it contains natural ingredients that don’t result in any negative side effects. Merrick understands that the best nutrition for dogs is one consisting of quality protein and healthy fats. In line with this, the manufacturer uses real whole foods, which are obtained from local farmers. Merrick grain-free dog food is suitable for all life stages and all dog breeds. Once you feed him this formula on a regular basis, he will be able to maintain a healthy weight while also enjoying the added benefits of a shiny coat. 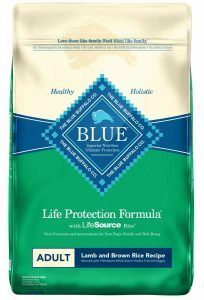 For pet owners looking for top-tier, high-calorie dog food at a reasonable price, there’s no better option than the Blue Buffalo Life Protection Formula. This dog food is available in four different sizes and it can suit all budgets. The best option is the 30-pound bag. With this formula, your pooch will be spoilt for choice when it comes to flavors. Whether he likes chicken, lamb, or fish, all recipes contain adequate protein and calories to help him develop healthy weight. Another plus of this dog food is that it contains zero chicken by-products. There’s also a total absence of soy, corn,and wheat so you don’t have to worry about any harmful preservatives or flavorings. 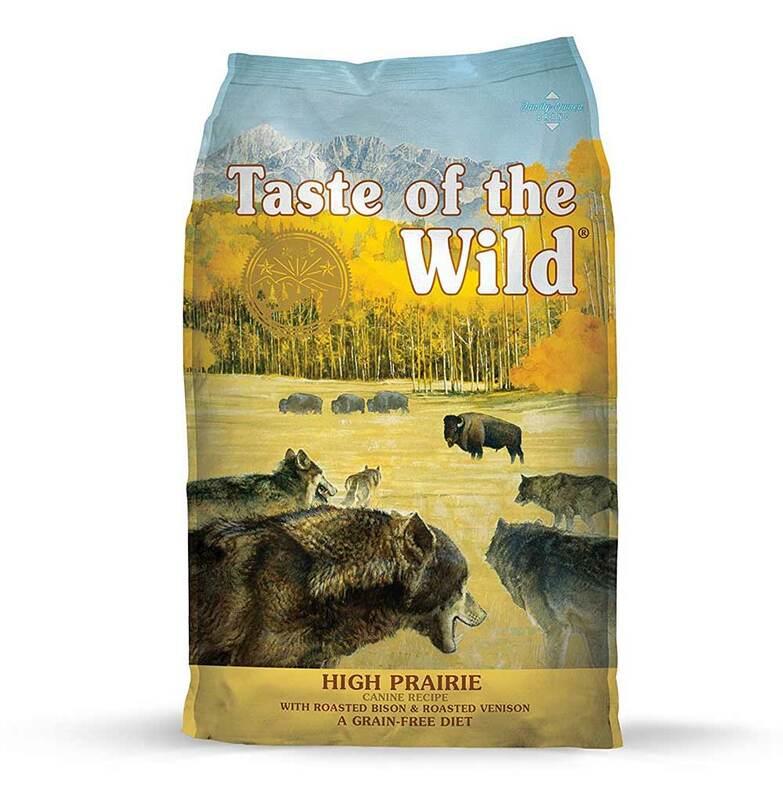 Taste of the Wild is one of the most trusted brands in the pet food industry, and for good reason. This manufacturer provides a vast range of foods that replicate the diet of dogs living in the wild. With this particular formula, your pooch will be getting 370 calories per each cup of kibble. Rather than using artificial substitutes, the manufacturer also uses real meat so as to provide your dog with high-quality nutrients. Apart from providing an excellent shot of calories, this dog food is enriched with fruits and vegetables that provide tons of antioxidants. Sweet potatoes and peas are also incorporated, giving your dog the energy he needs to go about his daily routine. Even though we chose the bison and venison formula, you are free to pick other options depending on your dog’s tastes. Other alternatives include boar, venison, and wildfowl—ideal for a dog that has an adventurous palate. The first step in helping your pooch gain a healthy weight is by first establishing why he has is thin. If his underweight is as a result of a health problem, you should seek medical help before switching his diet. Also, if you plan to increase his calorie intake, do it in phases. Drastic changes are not recommended as they can cause him gastrointestinal upset. It is also important to feed him quality food. Increasing his serving size won’t help gain any muscle mass if the food does not have any nutritional value. So, before increasing the volume of his food, do some research and find the best high-calorie dog food that can meet his dietary needs.